Cornwall is to get a new museum specifically for children. 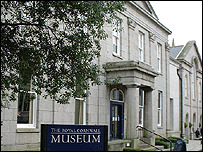 The Royal Cornwall Museum has secured funding for the £900,000 development at its site in Truro. The site will include interactive games and puzzles designed to get youngsters interested in the county's heritage. Work on construction of the new building, which will be called the Children's House, is due to start in September and it is hoped it will be open within a year. The annexe will be built next to the museum and is being jointly funded by Objective One; The Museums, Libraries and Archives Council and the Royal Cornwall Museum. The museum's director, Caroline Dudley, said it would be a "hands-on" exhibition. She said: "This is not going to be a place where things are objects in glass cases and there are long labels to read on the wall. "The idea of a museum specifically for children is fairly unique in the UK. "There are lots of science parks and that kind of facility but not one focusing on history, especially local history." Ms Dudley said the new centre, which is being designed by a firm of architects in Truro, would also create a number of jobs in the city and should be ready towards the end of next year.